Back again by popular demand, the Friends of the Hudson Area Library will hold its Second Annual two-day Art Book Sale during ArtsWalk weekend, Friday and Saturday, October 4th and 5th. This unique sale will be held at the Book Sale Room in the Hudson Library, from 10am until 2pm each day. The sale will feature hundreds of great books on art, graphic design, crafts, photography, architecture and interior design, as well as a large selection of titles on art history, artist’s monographs, biographies and various art techniques (watercolor, pastels, collage, etc.). Hardcover, paperback and coffee table books will be available. All books will be priced to sell—bargains abound at this once a year sale! And books make great gifts too, so stock up on wonderful titles for everyone on your list (and don’t forget to buy something for yourself!). Open every Saturday from 10am until 1pm, the Book Sale Room has the largest selection of gently used books in the area. 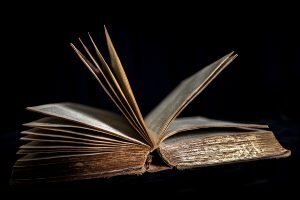 Here you can find thousands of books in more than 40 categories, including travel, gardening, cooking, mystery, fiction, humor, classics, poetry, self-help, science and history, as well as hundreds of children’s books and much more. The shelves are packed with great new inventory for the season, so be sure to come in and browse—you never know what great treasure you’ll find! And, all books are offered at very low discount prices. Arts Walk Weekend with the Friends of the Hudson Area Library! 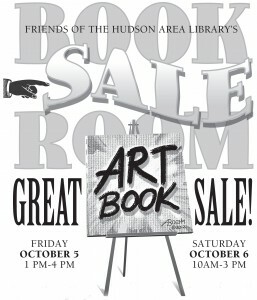 The Friends of the Hudson Area Library announces its special two-day Art Book Sale to be held on Friday, October 5th and Saturday, October 6th. This unique sale will take place at the Hudson Area Library Book Sale Room on Friday from 1pm until 4pm, and on Saturday from 10am until 3pm. The sale features a large selection of both hard and soft cover books on art, graphic design, photography, industrial design, architecture, and interior design, as well as many books on art history, artist’s monographs, crafts, techniques and artists biographies. All books will be offered at low discount prices for this special sale. Art books also make great gifts for the artists or enthusiasts on your holiday list, so be sure to not miss this wonderful opportunity to purchase great books at great prices! Also this weekend, check out “Open Book, an Open Photographic Exhibition”, on exhibit at the Library during open hours. Presented by the Friends of the Hudson Area Library and the Columbia County Photo Club, this exhibit features the work of sixteen members of the Columbia County Photo Club. Among the exhibited photographs are landscapes, flora, book studies and other still lifes by: Paul Abitabile, Bridget Arnold, C.C.Bailey, Ken Bovat, Ralph Gargone, J. Pierre Gontier, Deirdre Haber Malfatto, Thomas Holleufer, Joan Lezette-Miller, Peter Marotta, Marie (Beth) Meehan, Daniel Region, Vel Riberto, Doug Stalker, Sarah Sterling and Patricia Williams. The photographs are located in the computer room on the first floor of the library and along the hallway of the second floor of the library. All photographs are for individual purchase at the Library and a portion of the proceeds will benefit the Friends of the Hudson Area Library. For more information click here. This weekend there will also be a special cook book sale at the Chili Cook-off at the Hudson Waterfront Park Saturday, October 6th from 11 to 4pm. This one-time only event will offer a large and eclectic collection of vintage, new and gently-used cookbooks in many categories, including gourmet, children’s, quick meals and menus, as well as books on fall and winter dishes, holiday entertaining and more. For more information click here.